UFC Women's Bantamweight Champion Ronda Rousey will meet perhaps her toughest challenge to date as she welcomes the undefeated Cat Zingano to the Octagon for UFC 184 in Los Angeles. With the title on the line, the Staples Center in California will witness one of the biggest showdowns of the year for the coveted gold, along with some tantalizing action in store throughout the night. Here, I preview it all, breaking down the fight from the ground to standup, and offering my predictions. Striking Advantage: I give the striking advantage to Ferguson forsure. Ferguson has big power along with really crisp boxing technique. One thing about Ferguson is that he always takes the center of the octagon and controls the action. The only flaw in Ferguson's striking is that his chin tends to be straight in the air when he throws an uppercut. Tibau's striking definitely isn't the best, but he does have very good power and is really sharp in the 1st round, as so is Tony Ferguson. Tibau throws loopy punches that are telegraphed and easy to counter. Striking edge definitely goes to Ferguson. Grappling Advantage: Now this is where the fight gets interesting. Tibau has excellent top control and can be smothering when he gets on top. Tibau is easily one of the best grapplers in the 155lb division and has only been subbed one time in his MMA career. Tony Ferguson, on the other hand, possesses a deadly darce choke that he goes for just about in every fight. In Ferguson's fight with Danny Castillo, he struggled to get up from bottom. One thing about Ferguson is that even though he is always attacking from every position. Ferguson is a good wrestler as well, just not as good as Tibau. Grappling Advantage to Tibau. Breakdown: With a win in this fight either guy will probably find himself in the top 15. Tibau has played the role of "gatekeeper" for the last few years. Everytime Tibau gets in these fights to crack the rankings, he has come up short. Ferguson definitely has the biggest test of his career in Tibau ahead of him. Another factor is the conditioning of Tibau. Tibau tends to tire out in the 2nd and 3rd rounds due to that drastic weight cut, and not to mention he is taking this fight on short notice. Ferguson does not get tired and is a savage when it comes down to conditioning. Another thing is Tibau is significantly bigger than Ferguson and just stronger physically. It will be interesting to see how Ferguson deals with this when Tibau tries to lean on him early. I expect Tibau to look to shoot and Ferguson wants this fight on the feet. Prediction: This is a tough fight to pick. I think Ferguson could struggle in Round 1, but as the fight gets in round 2 and 3, Tibau will tire and gas out and Ferguson will go for the kill. I like Ferguson by 3rd round TKO. Tibau is a respectable opponent that has fought the best and is capable of pulling off an upset. Striking Advantage: Jouban definitely has the edge on the feet. He has good fluidity in his strikes and throws really good kicks. Walsh is really stiff when he throws punches and kicks, but seems to have decent power. Walsh is one of those guys that will keep coming forward, but mainly uses his strikes to get in clinch opportunities. Grappling Advantage: The grappling is hard to analyse. Both guys have only one submission win in their careers. In Walsh's last fight he was controlled and out-positioned a bit, and the same thing went for Jouban in his last fight. Jouban doesn't have the best takedown defense either, and Walsh has pretty decent takedowns. Its tough but I give a slight advantage to Walsh. Breakdown: This is a showcase fight for both guys since they were moved up to the main card. I think both guys won their last fights, but got screwed by judges. As for gameplans, I expect Jouban to want to keep this on the feet and Walsh to look to clinch and ware out Jouban. Prediction: Walsh is a tough guy, but I think Jouban will show his superior technical ability in this fight. Joban by unanimous decision. Striking Advantage: I give the edge to Ellenberger on the feet. Ellenberger and Koscheck both have big time power. Ellenberger at times can get impatient and rush in and get countered. At 37 Koscheck's chin seems to be diminishing a bit. Both guys are known for their big loopy punches and rarely utilize kicks a lot. I give Jake the edge due to power and Koscheck's suspect chin at this point. Grappling Advantage: I definitely give the edge to Koscheck. Koscheck is still one of the best wrestlers in MMA, and his takedowns are still impressive. We don't see much of Ellenberger on the ground, but he is coming off a submission loss. Ellenberger is a good wrestler himself, but rarely uses it that much in the cage. I give Kos the edge, but I don't see anyone being able to submit the other fighter. Breakdown: This is a make or break fight for both guys. The looser of this fight will probably be getting a pink slip. A few years ago, both of these guys were top ten 170lbers. I expect Koscheck to be really desperate and go for a lot of takedowns and try to push Jake up against the fence. I think Ellenberger wants to keep this fight on the feet and look to put one on Koscheck's chin. Prediction: I like Ellenberger by 1st round TKO. Striking Advantage: Holm definitely has the advantage. She has really good and crisp technique along with power. Out of all the girls at 135, I think Holm will be the most powerful along with Sarah Kaufman. Holm also uses kicks very well in her game for primarily being a boxer, and she has some vicious KO's to prove that. Pennington definitely doesn't have the best standup, but she sure is game and willing to trade. Grappling Advantage: I'll say Pennington has the edge on the ground mainly due to Holm's lack of experience on the ground against high level competition. Pennington had an excellent bulldog choke victory in her last fight that was really impressive. Breakdown: Holm is finally making her debut in the UFC, and she gets to do it in a co-main event spot. I am sure this will be the typical striker vs grappler matchup. I am sure Rocky doesn't want to play around on the feet too much with Holm and look to clinch against the cage to tire Holm and make this fight ugly and bloody. Holm just wants to show why every girl should be afraid of her when striking. Prediction: I like Holm by unanimous decision. I expect her to pick Rocky apart and have her guessing a lot. Pennington is super tough and durable, and I cant see her being finished. Striking Advantage: Even though Ronda is one of the few females to have a clean KO in her career, I think Zingano has the overall better standup game. Ronda is primarily a boxer, but in exchanges her chin is straight up in the air and she gets tagged a lot. Ronda has big power as showed in the Alexis Davis fight and is getting more comfortable throwing punches, but the fluidity still isn't there yet. Zingano has good punches, knees, and kicks. Both girls have tremendous chins as well. I give Zingano the edge just based on better technique and more variety of weapons. Grappling Advantage: This is a no brainer here. No one has been able to stop the judo throws of Rousey or stop her signature armbar. Zingano has really good wrestling, and hit a couple of old-school freestyle wrestling suplexes in her last fight. Zingano did struggle in Round 1 against Amanda Nunes to get up from bottom. Advantage to Rousey forsure. Breakdown: Rousey is invincible at this point in womens MMA. She beats her opponents before even stepping in the cage. I don't see that happening with Cat though, Cat is super mentally tough and has dug deep several times in her career. I expect this to also turn into a striker vs grappler match. Zingano wants to keep this on the feet as long as possible, and Rousey wants to do what she does best.. DOMINATE. Prediction: I like Rousey by 3rd round armbar. I think Zingano will have her moments and test Rousey on the feet, but Rousey's toughness will overcome it and she will lock and seal her patented armbar. As we await the bell to sound and for the lights, camera and action of the Octagon to descend upon Los Angeles, we question: Is Rousey about to be dethroned? 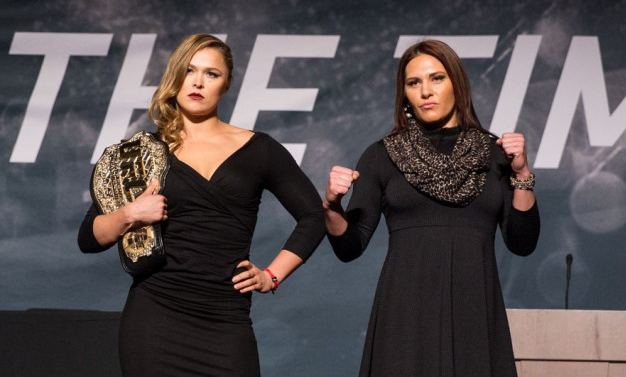 Preview, predictions, breakdown and more for UFC 184: Rousey vs. Zingano.